film (200 ft.) : si., b&w and col. ; 16 mm. reversal pos. film (550 ft.) : si., b&w and col. ; 8 mm. reversal pos. Collection contains home movies: footage of family, skiing, hunting, summer activities, a horse show, and a funeral. 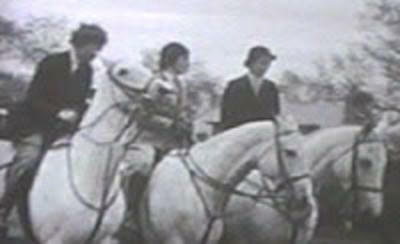 Travel footage includes scenes of the American West such as an amateur roadster race, rodeo, and trail ride in the mountains, and scenes of Europe. Possible Massachusetts footage shows a building sign "Bushway-Whiting Ice Cream" and a New York car license plate dated 1938. Dennis and Clare Sullivan, of Brooklin, Maine, bought this film at an estate auction for the Bushway family in the 1970s. J. Howard Bushway (1885-1980) lived in West Newton, Mass., and ran the Bushway Ice Cream Company in Somerville, Mass., started by his father in 1881. In 1929 the company merged to become Bushway-Whiting.